OLATHE — Nutty? Salty? Soapy? Goaty? Those are some of the descriptions Kansas State University and K-State Olathe researchers list in a new flavor lexicon that characterizes goat cheeses made in the U.S.
Martin Talavera, assistant professor of sensory analysis and consumer behavior at K-State Olathe, and Delores Chambers, professor of food, nutrition, dietetics and health and co-director of Kansas State University's Center for Sensory Analysis and Consumer Behavior, catalog the comprehensive list of descriptors and the science behind them in the study, "Flavor lexicon and characteristics of artisan goat cheese from the United States." It was recently published in the Journal of Sensory Studies. The lexicon describes the specific flavor characteristics of American-produced cheeses made from goat milk. While lexicons exist for cheddar, Swiss and other types of cheeses, cheese made from goat milk previously had no such guide. Flavor lexicons serve as important production tools for numerous aspects of cheesemaking — particularly adapting cheeses to meet consumer interests, Talavera said. For example, previous research shows that American consumers currently prefer more mild, less "goaty" flavors of cheeses that are made with goat milk. With a standardized flavor lexicon, cheesemakers could reduce the less desirable flavors in cheeses and other products made with goat milk and instead scale up the individual flavors and flavor combinations that match consumer demand. Researchers conducted the study using 47 artisan cheeses made from goat milk. Cheese samples were collected from California, Texas, Kansas, Georgia, Maryland, Wisconsin, Colorado and Connecticut. Samples included goat cheeses of the cheddar-style — those with waxy, nutty and sweet flavors; feta-style — those with saltier flavor profiles; chèvre-style — those with milder flavors; and mold-ripened — cheeses that were more pungent and sharp. Cheese samples were evaluated at the Center for Sensory Analysis and Consumer Behavior by a trained sensory panel, which was given previously developed lexicons for cheese products. Panelists sampled each cheese and then broke down the flavors into its most basic components, such as sour, bitter and buttery. Cheeses also were analyzed for their aroma, pungency, dairy sweetness, dairy sourness and mouthfeel, among other attributes. All cheeses also carried a unique goaty flavor. "Goaty is a very unique characteristic flavor attribute for products made out of goat milk," Talavera said. "It's very common across all of the different cheese styles, but it tended to be slightly higher for products with mold growth, which have a more complex flavor." Results from the goat cheese analysis were then compared to the flavors on the existing cheese lexicons. Researchers found that the cheeses made with goat milk evaluated in the study had five unique flavor characteristics — overall dairy, white pepper, lemon, black walnut and soapy. The flavor attributes of soy sauce, ashy/sooty and fish oil — flavors present in some cheeses made from cow milk —were not present in the cheeses made from goat milk that were evaluated in the study. In total, researchers generated complete flavor profiles for each of the 47 goat cheese samples evaluated using 39 flavor attributes. "The thought is that a producer can now use this flavor lexicon and its information as a resource for development, product benchmarking and quality control of goat cheeses," Talavera said. 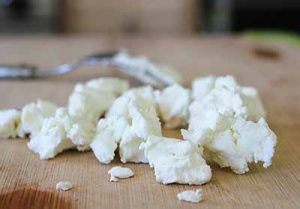 "A new producer, for example, can also learn what types of products are currently available on the market and the main flavors that consumers expect in certain varieties of goat cheese." This article was posted on Friday, February 24, 2017, and is filed under College News, Food, Nutrition, Dietetics and Health, Sensory Analysis Center.